The big melt will raise global sea levels. Climate change is causing Greenland’s massive ice sheets to melt at an increasingly rapid pace, researchers have warned—which could result in sea levels rising far faster and higher than previously predicted. Using satellite data and instruments on the island, scientists determined that Greenland shed 400 billion tons of ice in 2012, nearly four times more than in 2003. The losses paused in 2013 and 2014—because of a natural cyclical weather phenomenon—but have since resumed. 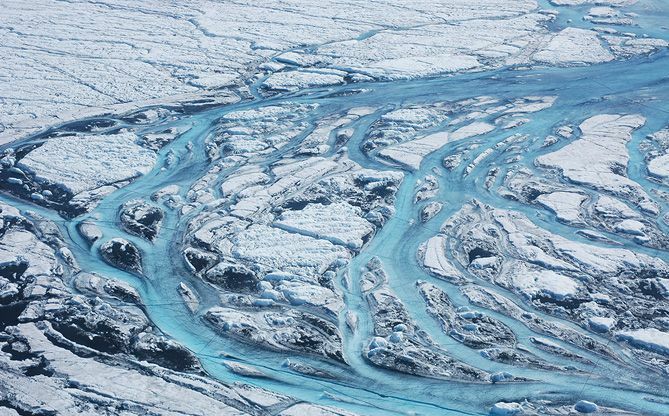 Much of the previous research on Greenland and climate change focused on the island’s southeast and northeast, where big chunks of glacial ice fall into the Atlantic. But the new study found that the largest source of continuous ice loss was in the island’s southwest, which has few glaciers. Instead, rising surface temperatures are causing the region’s inland ice sheets to melt, sending rivers of water streaming into the ocean. The Arctic is warming at twice the average rate of the rest of the planet, and most of Greenland sits above the Arctic Circle. “This is going to cause additional sea level rise,” lead author Michael Bevis, from Ohio State University, tells ScienceDaily.com. “We are watching the ice sheet hit a tipping point.” If all of Greenland’s vast ice sheet, which is nearly 2 miles thick in places, were to melt, global sea levels would rise by more than 20 feet, inundating coastal communities.